The Emerald Dove: Can High Street Perfumes Compete With High End Fragrances? Can High Street Perfumes Compete With High End Fragrances? Buying a new perfume is one of my favourite things. When I am stood in front of that big glass cabinet filled with shiny bottles, I feel like a kid in a sweet shop picking out a selection of penny sweets with their pocket money. I bought my first ever perfume when I was thirteen with money that I had been given for my birthday. I remember the woman who had served me in the shop passing me down countless bottles to spritz and the slight light-headedness that followed from inhaling too many scents. I eventually decided upon Gucci Flora because I loved the light, floral scent and the flowery packaging. It all felt so sophisticated and worlds away from stocking up on Charlie body sprays in Boots which was what I was accustomed to. Since then, the novelty of perfume buying has not worn off. I remained faithful to Gucci for a few years and tried a few different perfumes from their range. I then ventured into other brands like Dolce and Gabbana, YSL, and Bulgari but I never chose anything that didn't boast a designer label. However, that all changed last Christmas when my husband gifted me a bottle of Zara Femme. He told me how he had actually served a customer at his work who was wearing this fragrance and loved it so much that he asked her where she had bought it. I was touched by the fact that he had gone to so much effort to track down the perfect scent but the designer perfume snob in me was panicking. What if it doesn't last as long? What if it smells cheap? My head was buzzing with doubts about wearing a high street perfume. Thinking back, it seems ridiculous as I wear a full face of high street makeup and all of my clothes are from the high street but perfume was something that I had always thought of as being luxurious and high end. You can imagine my shock when I ended up loving the perfume. All of my doubts were totally unfounded. The perfume lasted just as long as my designer fragrances and I received so many compliments on the scent. So, when I was offered the chance to review two high street fragrances, I leapt at the opportunity. As someone who has recently seen the light and realised that there are some real fragrance gems to be found in high street stores, I wanted to put these perfumes to the test and see how they stacked up. I wouldn't be able to call myself a blogger if I didn't have at least a slight obsession with everything rose gold so I was certainly excited by this product. The packaging is really nice quality and I can't wait to display it on my dressing table alongside my other perfumes. In terms of the perfume itself, I was really impressed. In fact, I have every intention of repurchasing this once I have finished it. The scent is quite a warm and slightly musky scent which just screams sophistication to me - I feel like this is how Kate Middleton smells. 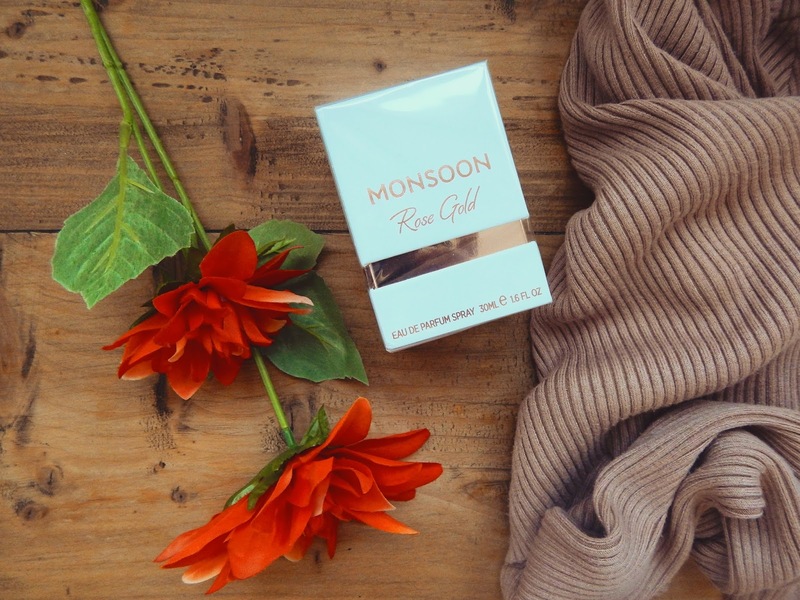 Monsoon describe it as having 'top notes of sparkling lemon, soft fruit and ozonic scents are layered with velvety rose, tuberose, neroli and cyclamen, and underpinned with base notes of Eastern woods, vanilla, mosses, musk and balsamic amber'. Personally, this is the kind of fragrance that I have always wanted to own but never committed to because I always opt for sweeter, more traditionally floral fragrances. It wasn't overpowering but the scent definitely wore well throughout the day and I could still smell it on my wrists before stepping into the shower in the evening. For £24 for a 30ml bottle or £35 for 100ml, I would say this fragrance definitely gives high end perfumes a run for their money both in terms of price and quality. 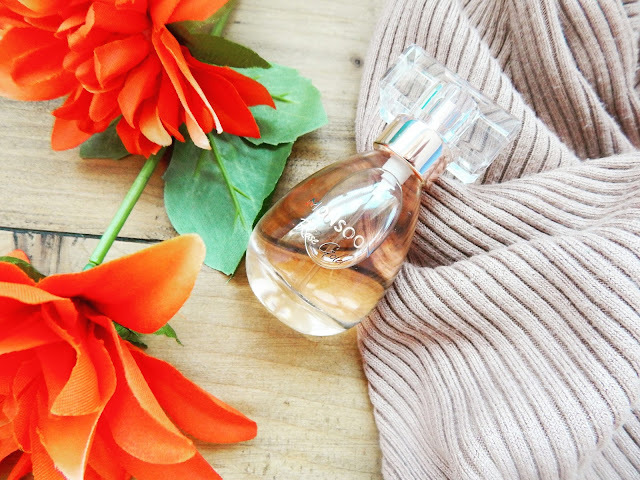 On trying this perfume, I was surprised by how different it was to Monsoon's Rose Gold perfume. I would say that this perfume is better suited to a younger person and would be perfect for someone who is just starting to experiment with perfumes. I would definitely have loved to receive this as a Christmas or birthday gift when I was in my teens. The scent is very sweet and floral but the vanilla undertones save it from becoming too sickly. 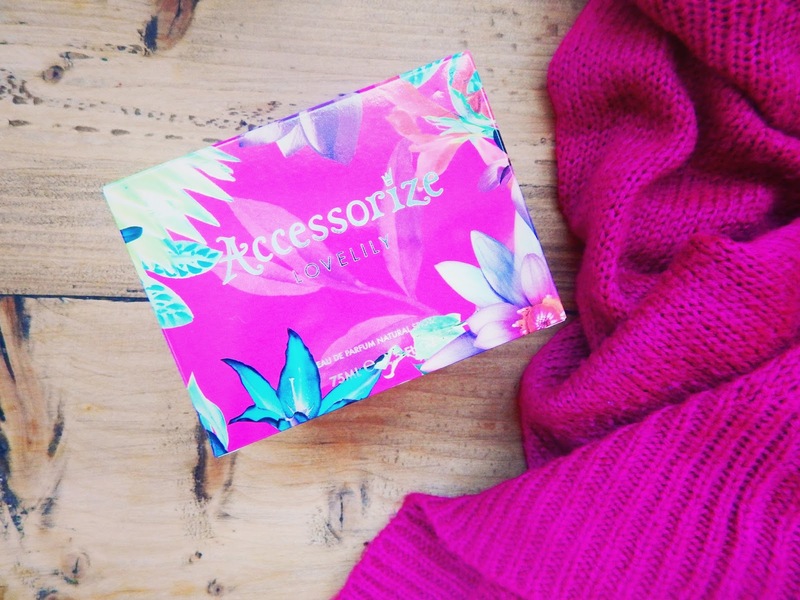 It described on the Accessorize website as being 'sweet and vibrant' and having notes of 'raspberry, orange, jasmine, and vanilla'. I would say that the raspberry and jasmine notes are the strongest which contribute to the sweetness of this scent and make it perfect as a fun and playful daytime scent. In terms of packaging, this product is a real winner. The box is a beautiful, vibrant pink and I love the flower design in the cap of the perfume bottle. For just £19, you get this large 75ml bottle which would be the perfect addition to any dressing table. Although this product isn't something that I would personally repurchase for myself as I feel like this product is too young for me, I can appreciate that this is a great deal for a good quality product and I wouldn't hesitate to buy this as a gift for a younger female relative. Clearly, the high street is putting up a good fight when it comes to the competition with high end fragrances. Products like Monsoon's Rose Gold show that you can get a good quality product for a fraction of what you'd spend on the designer brands. Also the high street makes perfume accessible to women of all ages and products like Accessorize's Love Lily are perfect for teenage girls who want to experiment with scents but have a more modest budget. What is your favourite perfume? Do you prefer high street or high end? I think high street perfumes are really upping their game. Next do nice ones and so do M&S. Quite a few dupes to be had too I think! I'm enjoying my Milton Lloyd 'Cuba' perfume. It's a really good Narciso Rodriguez For Her dupe and I think it was only around £7. I gathered these rundowns from deals and audits of ladies superstars' venice fragrances; they are for the most part going from early day to late night utilize.